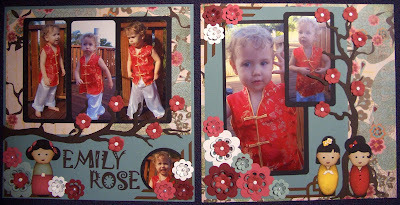 This week I have been playing with the new Instant Photo Cookie Cutter Die from the April Quickutz release. This is such a fun die and really much more versatile than it seems at first. You will need the the 12" platform and 12" cutting mat to cut this die, though, because it is a little longer than 4". I wouldn't want you to get it home and then be disappointed you couldn't use your new Instant Photo Die right away - although this is a great excuse to get the 12" platform if you haven't already!! I tried to do something a little different than just use it as an instant photo replica (although it is REALLY cute like that!) By turning it on its side and using colored cardstock instead of white, you get an entirely different look. I also used Diesel Classic and Lemonade skinni mini. and three smaller folders. I recently got the Spring Flowers and Paisley Set. 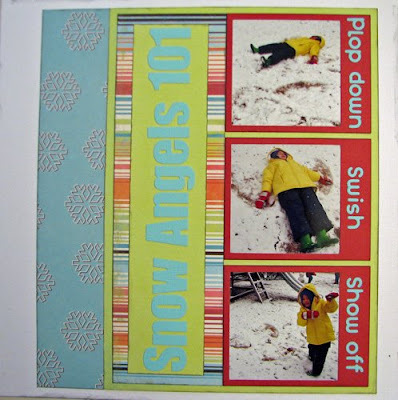 the plastic and ran it thru my Big Shot with the Sizzix Bigz Scalloped Square die. Paisley folder and ran it thru my Big Shot. sticker and some brads for a quick and easy card. The best part though was my "fancy"
Have you noticed this past year that giraffes and other zoo type animals have become so popular for baby items? I just love this CottageCutz Giraffe, he is so cute! 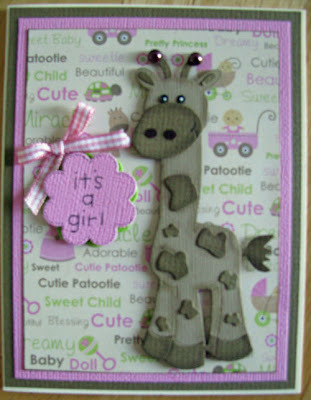 (I know I say this about all the CottageCutz dies I work with, but it's true) For this card I used some cute baby girl paper that had giraffes on it and copied the colors into my diecut giraffe. I shaded him with some chalk and used some Kaiser pearls for his.....what do they call those things??? LOL! I used some mounting tape to pop him off the card and then used the smallest Quickutz nesting flower die for the "it's a girl". If your a Quickutz fan and you haven't tried some of these CottageCutz dies you are missing out. Check them out and order a few before they're gone because they go quickly! COTTAGE CUTZ CUPCAKE TIER 4x4 die and the GO KREATE ‘BOO, FOR YOU’ 4x4 die. I’ve also used the QUICKUTZ APRON KS-0559, QUICKUTZ CHEF’S HAT RS-0242 and the QUICKUTZ HAPPY BIRTHDAY REV-0157-S die for the title which I cut twice in black & green so that I could mount it and make it stand out a little. The little tongs are from the QUICKUTZ CHEF'S COSTUME revolution die. I have also inked my die cuts with TIM HOLTZ DISTRESS INKS and sprinkled some KAISERCRAFT RHINESTONES on top of the cupcakes to make them sparkle. Congrats to you and thanks for everyone who entered this month! 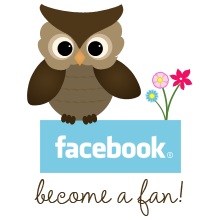 Don't forget to enter next month! Rebecca, you may contact Scrapping Cottage to choose your free die (excluding the alpha). Enjoy your shopping!! Don't miss out!! You have until midnight tonight to make a comment on this thread telling us which is your favorite die from the new April Quickutz Release for your chance to win a free die of your choice (excluding the alpha)! 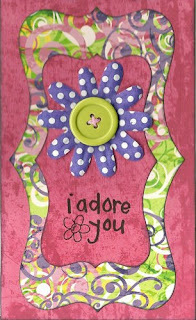 I have had a lot of fun this week using some of the new QUICKUTZ APRIL RELEASE DIES and they are just great. My favourite die from this latest release is the QUICKUTZ 12” BANNER BORDER DIE CC-BDR-033. I fell in love with it when I first saw it, and now that I have used it I know that I made the right choice choosing this die. It looks terrific on 12” x12”page layouts and even more fantastic if you add just a little inking or shading to it. The photo at the bottom of this post shows what a difference just a little inking can do to a die cut. 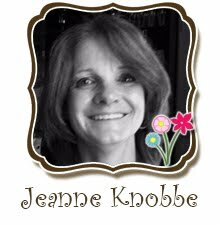 I used the TIM HOLTZ ‘walnut stain’ DISTRESS INK to make the banner look more 3 dimensional. 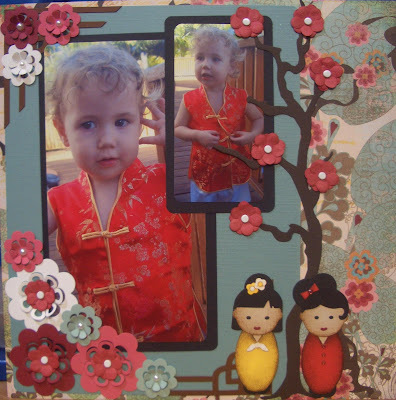 This layout would look great as the front page of a baby album, so I have not overcrowded it and instead used fewer die cuts to make the photo stand out more. As the saying goes “sometimes Less is more”, and that is what I have tried to achieve with my layout this week. The titles are made with the GO KREATE ‘NORTON’ alphabet. This is a Fabulous alphabet because it looks great and you are actually getting 2 uni case alphabets (1 larger alphabet like the one I used for my title, and a second smaller uni case alphabet like the letters that I used to write the name Jacob. (The ‘J’ is from the Quickutz Monogram Alphabet set which I double mounted) The larger size of the Norton alphabet has also got the Punctuation and Numbers. 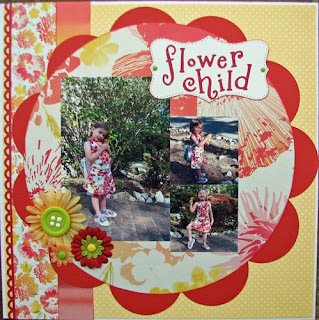 In this layout I have also used the new release QUICKUTZ CLIPBOARD REV-0195-S, the QUICKUTZ NOTEBOOK SHEET REV-0194-S which fits perfectly onto the the clipboard, the COTTAGE CUTZ WHEELBARROW OF FLOWERS, except I replaced the flowers with the GO-KREATE ‘BOO ON HIS BUM’ DIE . And finally I have used the QUICKUTZ RAINBOW & CLOUD. The QuicKutz new Back to the Basics release is filled with brackets, banners, arrows and lots of fun!! I am in love with the new Nesting Labels from the April Quickutz release!! Both sets are in the cookie cutter format and are so versatile! 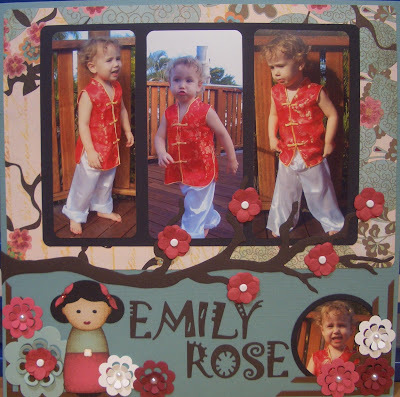 They would make a great addition to your collection no matter what type of paper crafting you enjoy. Today, I am featuring the longer rectangular set of nesting labels. This set comes with three different sizes of labels. Not only are you able to cut out solid labels in these three different sizes, the dies are also designed so that you are able to cut out label borders as well. So in reality, you get six different cuts from this set!! In my first project, I created a layout using SEI papers and the middle sized nesting label to create my title block. You can see what a great size this one is for creating titles. For my second project, I have created a card using the largest nesting label and the middle sized label together. 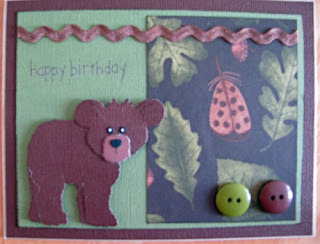 Keep checking the blog regularly for even more new projects using the fabulous dies from this latest Quickutz release. Plus, don't forget to leave a comment here telling us which is your favorite die from this release for your chance to win a FREE DIE of your choice (excluding the alpha) from the April release. Happy Scrapping!! One of the great things about Quickutz dies is that they are so well designed and allow for so much personal creativity and experimentation when assembling the different shapes together. However, occasionally, some shapes may seem a little harder to piece together than others. So here are a few tips to help make assembling your die cuts quick and easy! For my example, I have used the Anime Monkey from the March Release, but you could apply these tips to just about any of the dies. First, make all the cuts you will need to assemble your shape and gather all the pieces together. Now you can place some glue right at the top of the body where the nose/mouth piece will lay. Next, lift up the body and place the head piece down over the picture and add glue to the bottom of the head piece so you could place the body right back over the head piece. Here is another trick I use when you need to attach pieces that don't have a back. I simply place a little piece of scotch tape across the opening of the ears. Now you can easily place the inside pieces of the ears into the openings. This tip is also helpful when you are assembling a die cut like this one that you want to be able to lift of the page or card with a pop dot. Be sure to check out the new April Quickutz release in the store and don't forget to leave a comment here to be entered into the drawing for a free die of your choice from the new release (excludes the alpha). Here is another project using today's Quickutz release. I used the 12" Bracket border die. I cut my patterned paper to fit the shape of the die by tracing it on my patterned paper and then cut out my brackets and placed it over the top. I shaded around the edges of my layout, brackets and my title with Tim Holtz Milled Lavendar distress ink. 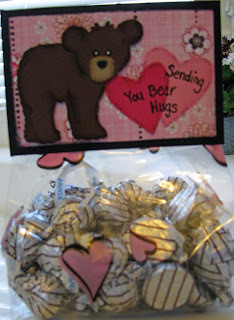 I used the Honeybee font for the title and the new Cookie Cutter Nesting Label for my journaling. 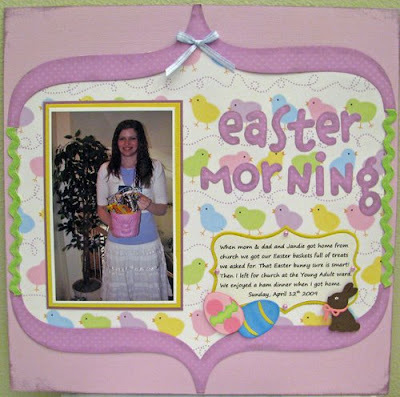 I also used the Chocolate rabbit and Easter egg Quickutz dies. I used these great Kaiser pearls on the label. 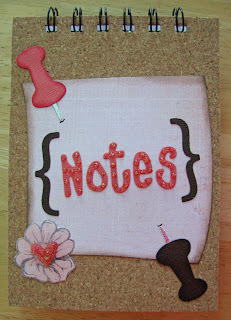 I used my Bind-it-All, the Quickutz Media sheets and today's new release to make this notepad. I took a sheet of the white chipboard and cut it in half then applied a half sheet of the cork to the front and then used my Bind-it-All to put the holes and the wire at the top. Then I decorated it with the Office Supplies Cookie Cutter set and the new 2x2 bracket die and the Chick-a-dee font. On the inside I made a pocket and slipped a notepad in it so I can reuse this even when this pad of paper is gone. Check in throughout the day for more projects using today's new Quickutz release. New Quickutz April Release - Back to Basics!! Come and check out all the great new shapes from the April - Back to Basics - Quickutz Release!! You are going to want to use these new shapes on every layout and card you make! Don't wait too long to place your order because these are going to go fast! And of course, don't forget to leave us a comment on THIS POST as to which of the new dies is your favorite for a chance to win your choice of one of the these fabulous new dies (alphabet excluded). dimension and depth. 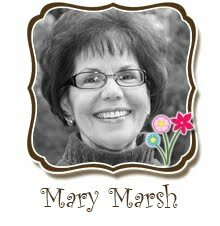 The papers are by Graphic 45 and the rub-on by Karen Foster Design. This week I have chosen to work with the QUICKUTZ 4x4 DOLLS DIE REV-0193-D. I had so many ideas for this die, but time was limited so I decided to work on a double page layout and a card. Can you imagine what gorgeous stick puppets these cute little dolls would make if you attach them to the top of an ice-cream stick Or attached them to serviette rings, menus or place cards for an Oriental dinner setting. 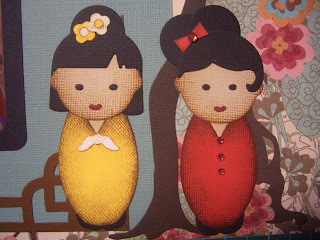 If you have a recipe box or book, why not add a little Oriental theme to your favorite Asian recipes using these gorgeous dolls to decorate your recipes. I could keep on going but will get to the two projects that I worked on this week. 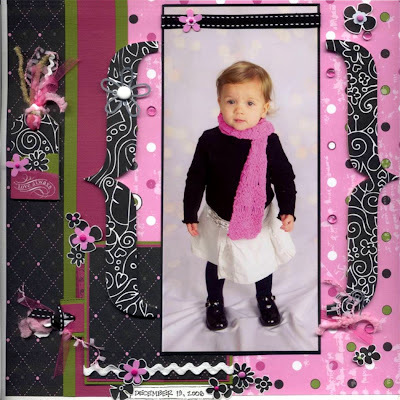 The first project I worked on this week is a double page layout I did of my daughter on Christmas Day. She was given this little outfit by our dinner hosts and she wears it permanently so I thought this would be a great layout to document her love for this outfit and the perfect opportunity to use the QUICKUTZ DOLLS REV-0193-D.
KAISER CRAFT PEARLS for the centers of the flowers, KAISERCRAFT RHINESTONES for the buttons on the dolls dress & hair ties, TIM HOLTZ DISTRESS INKS, SIZZIX DECORATIVE ACCENT, QUICKUTZ 12” TREE CC-BDR-021, QUICKUTZ LIMITED EDITION CIRCLES REV-0072, QUICKUTZ NESTING FLOWERS CC-SHAPE-6-017, and finally for my title I used the classic 2x2 QUICKUTZ ZELDA ALPHABET die set. The 2nd project I want to share is this Card I made also using the QUICKUTZ DOLLS REV-0193-D. 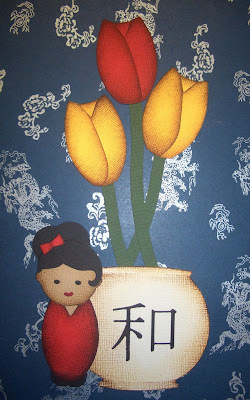 I used the dolls die for the doll and also used the dolls body to make the tulips. I have used this example as I have been asked how I make my die cuts if the back sides of them are visible. 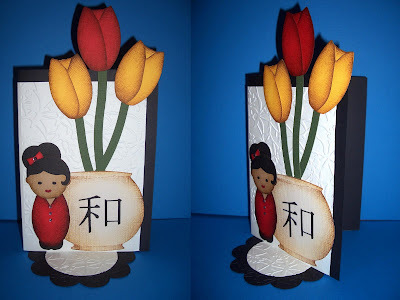 You will see in my pictures that the Tulips go off the edge of the card and will be visible from the back, so I have cut the die cuts out twice, stuck them back to back and decorated them before I attached them to the card. How you decorate the back will depend on what die cut you are using. For example if you want to use the Doll so that it shows the front & back you will cut the face twice- one in beige and one in black so that the black side looks like hair on the back of the head. 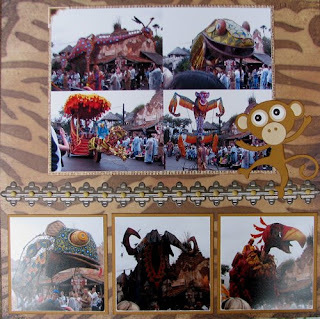 The bottom picture is a view of the card lying flat and also a close up view showing the back of the die cuts. 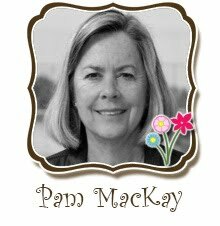 To make this card I also used the CUTTLEBUG EMBOSSING FOLDER – FLORAL SCREEN to emboss my cardstock before I started. 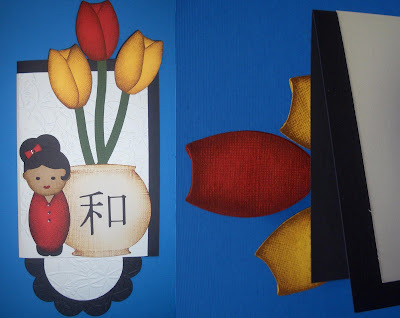 I then cut out the QUICKUTZ FLOWER REV-0034 die and embossed it with the same CuttleBug embossing folder and attached it to the bottom of my card, making sure that just over half of the flower can be seen. The top section of the flower is glued to the inside front cover of the card. I have cut this flower out twice, the second one in black to stick back to back with the white flower so that when you open the card all you see is a large black flower. All the glue, tape etc that you used to attach the flower to the card is hidden between the 2 layers of the flower. The bowl is cut from the SIZZIX Fish & Fishbowl die, Stems are cut with the wavy blade from my paper trimmer, and the words on the front of the bowl which read ‘Harmony’ are cut from the QUICKUTZ HARMONY die. I inked my die cuts with TIM HOLTZ DISTRESSED INK and used KAISERCRAFT RHINESTONES for the front of the dolls dress and her hair bow. 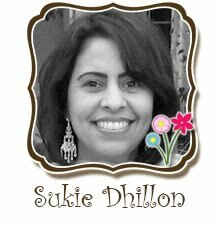 Once everything is attached, fold the flowery flap at the bottom upwards and it turns that section of your card into a doily / stand. Welcome Aboard, Matey! Look alive, you're gettin' ready to cast off on one of the most magnificent ships to ever sail the open sea! The Scrapping Cottage's Exclusive Pirate Ship will leave you fully equipped to take on your next pirate or high seas adventure project!!! X marks the spot! Find all of your treasures at The Scrapping Cottage!! I have been playing with the Quickutz Anime Monkey this week. 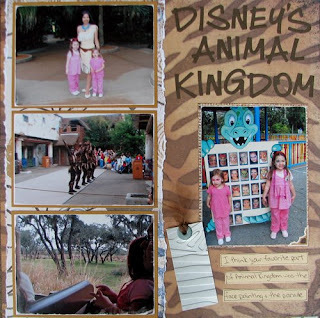 In my first project, I completed a layout with pictures from the Animal Kingdom at Disney World and my monkey was more traditional with just some inking on the edges and Star Dust Stickles on the eyes for a touch. Then I wanted to have a little more fun and starting cutting him out in different colors. 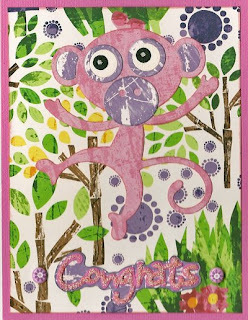 Once I hit pink, I knew I had to make a card with this pink monkey. Again I used stickles on the eyes and I also traced the word congrats with my Candy Cane Stickles. 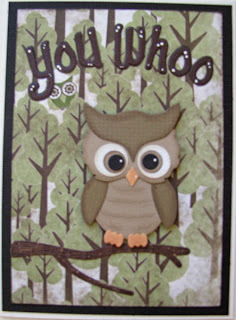 "Owl" admit it - I like to put catchy sentiments on my cards to go with the diecut I'm using. So here's a TIP for you. 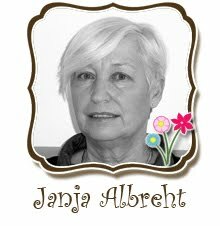 Make a list of all the cute sentiments or quotes you like and either find a diecut or stamp that goes with it or take a diecut/stamp and make a list. I've taken this cute CottageCutz Owl (he's 2 1/2" high) and made a card with it, then looked at my "Owl" list to see what saying I wanted to use. 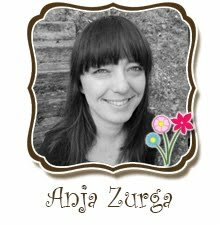 This week I chose to work with the adorable CottageCutz Bear. He is so dang cute and so versatile for all those different cards and projects you want to do. He's perfect for all those fun bear sayings and sentiments you've heard through the years. He is so quick and easy to put together too! He has 6 pieces: the body, head, muzzle, nose and eyes all on 3x3 die. 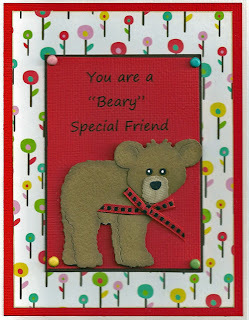 So whether you need a manly card, or something for a special friend this bear is perfect! give you an idea of how the card works.) 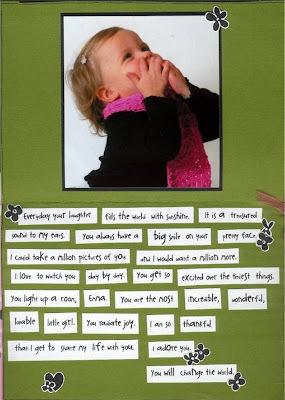 The "Surprise" card uses Sizzix dies and also a rub-on. The frog images on the other three cards are the Penny Black (Clear Stamp Set Called Toadily). Watch for it Wednesday #5!